Did you notice the black 4GB iPod Nano ads in the left navigation of our main site? 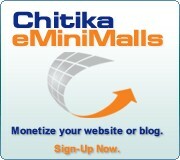 We’re testing the Chitika eMiniMalls advertising concept. So far, we’re very impressed and they will make a nice compliment to AdSense. They do have a contextual option that we’re not using, but we are implementing Chitika right now for all of the hundreds of thousands of page views of traffic that our site generates that Google does not have ads for. Chitika is not a Google AdSense replacement, but I do like how we are able to serve up image ads that will offer related products from a wide inventory of hard goods. Over the next week the ads that Chitika serves up will become more relevant as we are setting up our site to allow per-channel advertising…meaning, we’ll be able to serve up specific ads in each channel rather than one set of them across the entire site. Don’t worry as we’re not going to go nuts and clutter up our site, even if it’s more profitable to do that in the short-term. We like having a clean site also that doesn’t have any of those punch the stupid monkey banner ads. If you are a publisher and earn money via advertising, I highly recommend that you check out and test Chitika yourself.